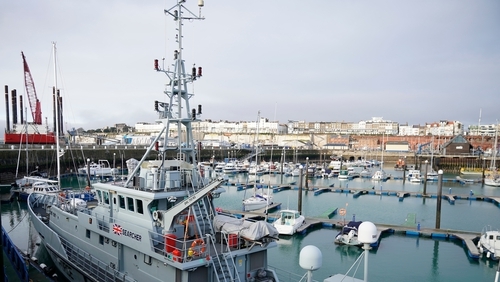 A company with no ships and which has not previously operated a service has been given a £13.9 million contract by the British government to run extra ferries as part of preparations for a no-deal Brexit. Seaborne Freight was one of three companies awarded contracts totalling £108 million last week to lay on additional crossings to ease the pressure on Dover. The company aims to operate freight ferries from Ramsgate to the Belgian port of Ostend, beginning with two ships in late March and increasing to four by the end of the summer. But a Conservative county councillor for the Kent port town said he did not believe it would be possible to set up a new service from Ramsgate by the scheduled date of Brexit on 29 March. Cllr Paul Messenger questioned whether the government had carried out sufficient checks on the firm, telling the BBC: "It has no ships and no trading history so how can due diligence be done? "Why choose a company that never moved a single truck in their entire history and give them £14 million? I don't understand the logic of that." Seaborne was established two years ago and has been in negotiations about running freight ferries between Ramsgate and Ostend, but no services are currently running. Narrow berths in the port mean there are few suitable commercial vessels available. In a statement, the company said it had been working since 2017 on plans to reintroduce ferry sailings from Ramsgate from early 2019. The business has been "financed by the shareholders" during a development phase involving "locating suitable vessels, making arrangements with the ports of Ostend and Ramsgate, building the infrastructure - such as bunkering - as well as crewing the ferries once they start operating". It added: "It was intended to start the service in mid-February but this has now been delayed until late March for operational reasons. "This coincides with the Department for Transport's Freight Capacity Purchase Agreement with Seaborne which is part of their preparations to increase ferry capacity in the unlikely event of a no-deal Brexit." Ramsgate has not had a cross-Channel service since 2013, when operators TransEuropa collapsed. Liberal Democrat home affairs spokesman Ed Davey said: "That the government has reportedly signed a contract with a ferry company with no ferries pretty much sums up their farcical approach to the entire Brexit fiasco. "The government could, and should, take the threat of a no-deal Brexit off the table. It is being used only to try and scaremonger people into backing their deal. It is now costing the country millions - it is inexcusable and people won't be fooled. "People must be given the final say on the Brexit deal with a people's vote where they have the right to choose to remain." Labour MP Tonia Antoniazzi, a supporter of the Best for Britain campaign for a second referendum, said: "Never has it been clearer that our government is selling us down the river over Brexit. "A firm that has never run a ferry service before has been awarded a multi-million pound contract and they don't even have any ships. "We know our ports aren't ready for a no-deal disaster, but is hiring a firm that's never dealt with this kind of thing before really going to help? This idea should have been sunk before it saw the light of day." A Department for Transport spokesman added: "This contract was awarded in the full knowledge that Seaborne Freight is a new shipping provider, and that the extra capacity and vessels would be provided as part of its first services. "As with all contracts, we carefully vetted the company's commercial, technical and financial position in detail before making the award."